The real effects of monetary policy are still heavily debated because monetary policy affects real quantities, such as employment or GDP growth, with a delay. For this reason, to understand the transmission mechanisms of monetary policy, researchers have studied the response of financial markets in narrow windows around monetary policy actions. Monetary policy has large and immediate effects on stock markets. Bernanke and Kuttner (2005) show that a contractionary monetary policy shock of 25 basis points created a drop in broad stock indices of more than 1 percentage point within minutes of the policy action. This response is large, given that the annual equity premium is around 6%. It is even more remarkable that equity markets move in a predictable manner ahead of policy decisions. 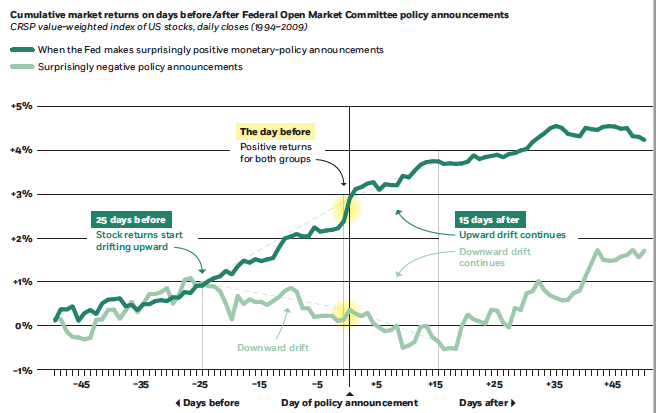 Lucca and Moench (2015) show that the S&P 500 increases in the 24 hours before scheduled Federal Open Market Committee (FOMC) meetings whether the policy decision is expansionary or contractionary. They label this unconditional increase in returns, which averaged 49 basis points, the 'pre-FOMC announcement puzzle', and leave the challenge of explaining it to future research. In a recent study (Neuhierl and Weber 2018), we find that returns not only drift in the 24 hours before policy decisions or react to policy actions on impact, but they move as far ahead as 25 days before a policy decision is announced. Source: Neuhierl and Weber (2018). Figure 1 plots the cumulative excess return of the CRSP value-weighted index, which covers all stocks traded on NYSE, Nasdaq, and Amex over the risk-free rate in event time around monetary policy decisions by the FOMC. Zero indicates the day of the policy decision. The other numbers reflect trading days around the meeting. The dark-green line on top shows returns around meetings with expansionary policy decisions, whereas the light-green line shows returns around meetings with contractionary policy decisions. We use futures on the federal funds rate to obtain market expectations of monetary policy actions and construct high-frequency policy shocks in a 30-minute window around the press statement release of the FOMC policy decision, following Kuttner (2001). Shocks are contractionary when the FOMC set the new federal funds target rate above the rate markets expected before the press release. The sample period is 1994 until 2009. The communication strategy of the FOMC determines the starting date, because no press releases existed before 1994. After 2009, we no longer observe conventional monetary policy shocks because of the zero-lower-bound constraint on nominal interest rates. On the day of the announcement, markets increase on average when there are expansionary surprises, and tend to drop when there are contractionary surprises, in line with Bernanke and Kuttner (2005), Gorodnichenko and Weber (2016), or Ozdagli and Weber (2017). On day –1 – that is, the 24 hours before the FOMC meeting – stock returns drift upwards independently of whether the policy decision on the following day is contractionary or expansionary. This is the pre-FOMC announcement drift that Lucca and Moench (2014) discovered. The surprising part of Figure 1 is, however, that returns already start to drift upwards 25 days before expansionary FOMC policy decisions, and downward before contractionary policy decisions. This drift implies a differential cumulative return until the day of the FOMC announcement of around 2.5 percentage points. The sustained differential pre-drift across expansionary and contractionary monetary policy shocks many days before the FOMC makes its decision is surprising because market participants do not know the decision in advance. It suggests conventional monetary policy shocks might not be shocks after all. Returns do not only drift upwards before the FOMC announcement; they continue this differential drift for many days afterwards. On average, the difference in the drift from before until after the announcement, across contractionary and expansionary surprises, is around 4.5%. This is large relative to an annual equity premium of 6%. We refer to the return drift around monetary policy decisions as 'monetary momentum'. The return drift also occurs in international equity markets. We find a differential return drift for benchmark equity indexes around US monetary policy decisions in Germany, Canada, France, Spain, Switzerland, and the UK with magnitudes comparable to those in the US. Japan is an exception. Returns are flat for both contractionary and expansionary US monetary policy surprises, replicating the non-existent pre-FOMC announcement drift for Japan in Lucca and Moench (2015). Figure 2 replicates Figure 1 for the CAC 40, the French stock market index. The result is even more puzzling, because stock returns in France drift ahead of US policy decisions, and continue their differential drift subsequently. This is further evidence of the importance of global financial cycles (see Miranda-Agrippino and Rey 2015, for example). We compare the Sharpe ratios of monetary momentum strategies with the Sharpe ratios of a buy-and-hold investor to gauge the economic significance of the return drift around FOMC meetings. We find Sharpe ratios increase by a factor of four for a simple monetary momentum strategy that investors can implement in real time. We also find standard return factors cannot span our monetary momentum strategy with a large unexplained return of 9.6% per year. Recently, Moskowitz et al. (2012) popularised time-series momentum strategies. We are able to show that time-series momentum and monetary momentum are two separate economic phenomena. Predictability and persistence in the monetary policy shocks themselves might be driving the return drift we uncover. 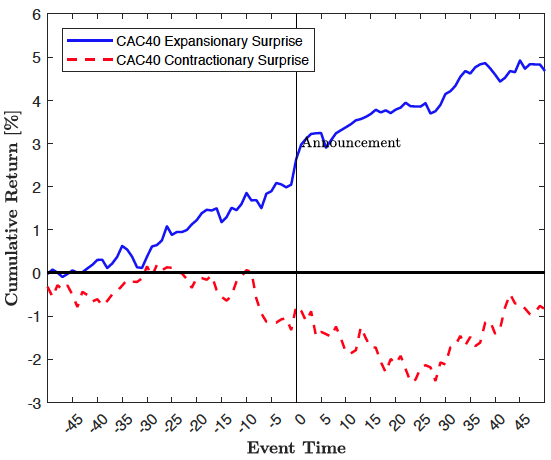 We find expansionary surprises follow contractionary and expansionary surprises with equal probabilities, and the sign of past surprises cannot predict the sign of current surprises. These patterns mean that persistent shocks and predictability in monetary policy decisions are unlikely to explain our results. Another possible explanation might be a state dependence of monetary policy shocks. The FOMC might surprisingly cut rates in times of high risk or risk aversion, which could possibly explain the upward drift around events we associate with expansionary shocks. However, we also find that observing expansionary or contractionary surprises is equally likely in times of high and low economic uncertainty, as measured by the VIX. There has been much research on the effect of monetary policy on asset prices that uses narrow event windows of 30 or 60 minutes around FOMC policy decisions to obtain identification. The large drift before and after FOMC decisions suggests researchers might underestimate the effect of monetary policy on asset prices by restricting attention to narrow event windows. The magnitude of the drift around FOMC decisions suggests asset-pricing theories that aim to understand the unconditionally large excess returns of stocks relative to bonds should focus on channels through which monetary policy and asset markets interact. Finally, the pre-drift around FOMC decisions implies 'surprise changes' in target rates might partially be predictable, which has important implications for the research in macroeconomics and monetary economics that attempts to understand the real effects of exogenousmonetary policy shockson real consumption, investment, and GDP. Bernanke, B S and K N Kuttner (2005), "What explains the stock market's reaction to Federal Reserve policy?" The Journal of Finance 60(3): 1221-1257. Gorodnichenko, Y and M Weber (2016), "Are sticky prices costly? Evidence from the stock market", American Economic Review 106(1): 165-199. Kuttner, K (2001), "Monetary policy surprises and interest rates: Evidence from the Fed funds futures market", Journal of Monetary Economics 47(3): 523-544. Lucca, D O and E Moench (2015), "The pre-FOMC announcement drift", The Journal of Finance 70(1): 29-371. Miranda-Agrippino, S and H Rey (2015), "US monetary policy and the global financial cycle", NBER working paper 21722. Moskowitz, T J, Y H Ooi, and L H Pedersen (2012), "Time series momentum", Journal of Financial Economics 104(2): 228-250. Neuhierl, A and M Weber (2018),"Monetary Momentum", NBER working paper 24748. Ozdagli, A and M Weber (2017), "Monetary policy through production networks: Evidence from the stock market", NBER working paper 23424.